Ask fellow campers about "Jenny Ridge Venue & RV Park" and nearby attractions. Extra-long, level gravel site. Clean restrooms, good laundry room with reasonable rates ($1.50 to wash and $1.00 to dry), large dog run, and a great location close to Folkston for smaller shopping trips but only 30 minutes from Waycross and Kingsland for bigger shopping needs. We camped at Jenny Ridge Venue & RV Park in a Fifth Wheel. Be sure to check out Whistlin' Dixie for gifts, memorabilia, good food and great conversations. stayed here recently. the park is new, but layed out poorly. the hookups are right at the end of each pull thru so if you leave your vehicle on tow you probably wont be able to reach some or all the hookups. the wifi is off and on for most all campers according to what the manager said -problematic. the managers are mostly ok, but the man can be irascible -a snootfull. i probably wont be back and do not recommend. We camped at Jenny Ridge Venue & RV Park in a Motorhome. Campground was an open area with no trees, gravel sites and a lot of noise from road traffic. On the other hand spacious sites with fire pits and picnic tables. As we were here with a group we had access to the clubhouse and kitchen which was really nice. This is a newer park with a great managemnt team. We camped at Jenny Ridge Venue & RV Park in a Motorhome. Folkston train funnel was fun, town small and old. Okefenokee Swamp was great as was our boat trip with Okefenokee Adventures. Matt our tour guide was excellent. Very helpful couple. Guided us to our site. Watch out for ants. Some full time residents on the back row. We were parked near the road so we didn't have to unhook and easy access out. A lot of traffic on 3o1. We camped at Jenny Ridge Venue & RV Park in a Motorhome. We stayed here a week. Well run new park. Site fairly level & gravel. Trains could be heard but not too loud. Traffic noise from highway not a problem at night. The only negative was the WiFi signal which was very poor. The park was very empty so, at busy times, we're guessing the signal would be non existent. Staff very friendly. Laundry room clean. Very good value We'd stay here again. Great for access to Okefenokee Wildlife Refuge. We camped at Jenny Ridge Venue & RV Park in a Fifth Wheel. Go to Jalen's BBQ for great take out - very close to the park. Very nice new campground in Folkston. Sites are all full hookups, gravel, super long and level. Nearly all of the sites are pull through sites. All sites have a picnic table and a fire ring. Good gravel interior roads. Campground hosts live on-site and are very nice. Individual bathroom/showers which were very clean. Highly recommend if you happen to be in the area. We camped at Jenny Ridge Venue & RV Park in a Motorhome. Great place to stay. VERY friendly staff, clean private restrooms / showers. Good wi-fi. All sites have complete hook-ups, all sites look to be pull thrus. 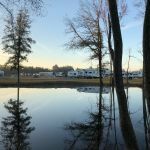 We camped at Jenny Ridge Venue & RV Park in a Travel Trailer. If you are a train watcher, Folkston is the place to be. Visit the Folkston Funnel viewing stand. Go north to the 1st traffic light, McDonalds on the corner, turn left, go to RR tracks and turn righ, viewing stand just down the street.. The Folkston RR museums is a great place to visit and watch trains also. LP available, washers & dryers available. Great park for an overnight stay or a couple of weeks. I was traveling north and found this park just north of Jacksonville. Everything is new. the Owners are very easy to work with and will do everything to help you. The owner even asked me if I needed any help getting set up. The park is located in Folkston, a very small historic town. We camped at Jenny Ridge Venue & RV Park in a Fifth Wheel. Trains are Folkston claim to fame. There is a train station in town where everyone sits and watches the trains go by. Long, Long, Long freight trains with Grafitti on just about every car. Two buffet restaurants, Super market, and gas stations for Diesel. 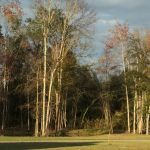 Okefenokee National forest, boat rides and hiking trails. Everyone in town treated you like you lived here forever. Will be stopping by here again the next time I travel in this direction. Very nice park and very nice service. During the day, the traffic is from the train and the street. In the night there is silence. Two nice lakes in the park. Very powerful wifi. We camped at Jenny Ridge Venue & RV Park in a Motorhome. Brand new park, found on the Passport America website. Very nice and helpful couple who run the park. Park is beside a fairly busy highway but noise level was acceptable. Its proximity to Okefenokee National Wildlife Refuge was a plus. It sits on the Florida/Georgia line and close to I95. We would stay here again, great value for the price. We camped at Jenny Ridge Venue & RV Park in a Motorhome. Take the Okefenokee Adventures tour, well worth it. Are you affiliated with Jenny Ridge Venue & RV Park ?